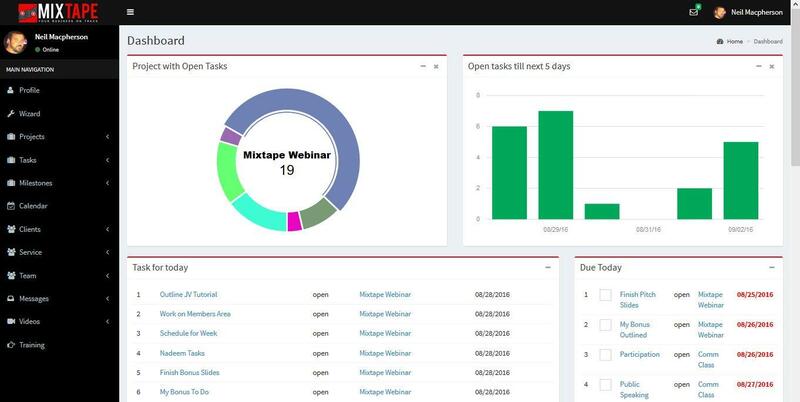 Our Mixtape Project Management Platform was designed with today’s marketer in mind. Not only can you do standard things like create projects, tasks, milestones and so forth but we have some killer features that other platforms simply don’t offer. In addition to the standard PM features we also made it so you can manage your services, clients, team members and even train them all from one central dashboard! Plus we included several time savers such as project cloning, pre-loaded tasks for services sold and internal commenting threads! Normally you would have to pay monthly or annually for a tool like this AND they would limit your users, projects, storage or other key things you need. With Mixtape you get UNLIMITED USERS, UNLIMITED PROJECTS and UNLIMITED STORAGE! That’s right, NO RESTRICTIONS and NO ADDITIONAL COSTS!!! Click here to Watch the Demo and Get Mixtape for 65% Off! person that really knows what they’re talking about on the net.